When autumn hits, Halloween is right around the corner. This holiday is filled with an abundance of candy. 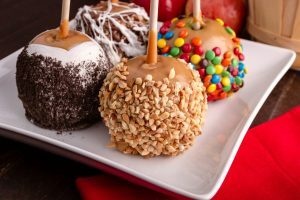 Although most people like to indulge in sweets during this season, it is important to learn protection tips that maintain your positive dental health. Here are some ways to keep your mouth healthy after enjoying some sugary treats. Select the Best Sweets. It is best to stay away from hard candy that remains in your mouth for prolonged periods of time. The longer candy has access to your teeth, the more likely they are to suffer decay. Avoid Sticky Situations. Since sticky candy, including gummy bears, often clings to your enamel, it takes a long time to become washed away with your natural saliva flow. This heightens the likelihood of tooth decay. Therefore, it is best to stay clear of these kinds of sweets. Drink Water. Besides remaining hydrated, drinking water helps wash away food from the mouth. If the water is fluorinated, it will help prevent decay as well. Brush and Floss. The American Dental Association advises individuals to brush and floss regularly. A person should brush twice a day for two minutes at a time. This removes candy and other sweets that remain in the mouth. Flossing is vital as well. It removes bacteria that gets trapped in areas a toothbrush cannot reach. Also, it eliminates food debris from the gum line. Visit Your Dentist. The best way to preserve your dental health is by visiting your dentist on a regular basis. This professional can detect problems early so that they do not become major. Also, your dentist will perform a cleaning that is sure to remove any hidden food or plaque buildup. Dr. Dana Walters wants everyone to enjoy their fall treats. However, he wants to make sure that you are smart about your oral health. Be sure to consult with him and discover essential protection tips that will keep your smile looking its best.